Traveling California’s Pacific Coast Highway by convertible is on lots of people’s bucket list – but there is a more relaxing (and traffic-free) way to get the same views. You can see this gorgeous stretch of the Pacific Coast by Amtrak train for under $100, and don’t let driving detract you from these views. In fact, Amtrak claims the only vantage point that rivals its Pacific Surfliner Train route is from a surfboard. 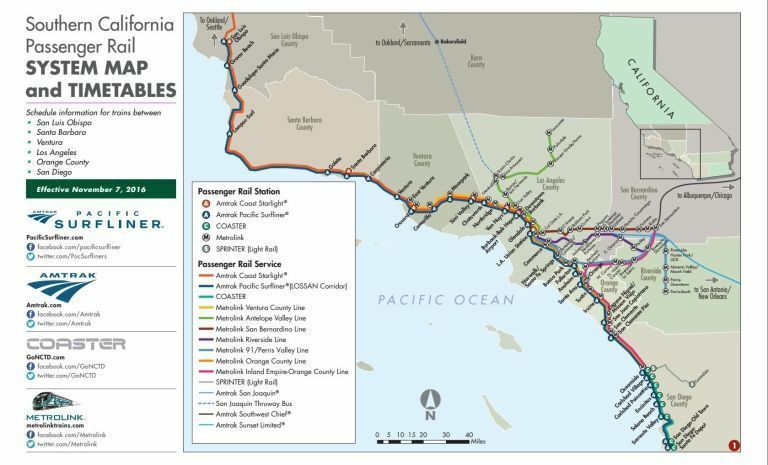 The coast-hugging train goes from San Diego to San Luis Obispo with in-between stops at some of Southern California’s most beautiful towns. After increasing service last fall, the route now offers 11 round-trip services each day and five between Santa Barbara and San Diego. The full stretch from SAN to SLO takes approximately 5 hours and 45 minutes, but we suggest booking multi-city stops to get the most out of your railroad adventure. Some notable Surfliner stops include San Clemente Pier, a picturesque place to watch the sun set; Anaheim (hello Disneyland! ); and Oxnard, known for its strawberry fields and strawberry festival in May. Plus, these particular trains have special bicycle racks — reservations required — giving you an excellent excuse to explore your stopover destinations by pedal. Our recent search for tickets returned a fare of $61 for a straight-shot from San Diego to San Luis Obispo during the second weekend of July. With stops in Los Angeles and Santa Barbara, the rate is $103. Once in San Luis Obispo — one of the oldest cities in the state of California, founded in 1772 — the historic Granada Hotel offers boutique accommodations within walking distance of downtown landmarks like the Elmo Theatre. The surrounding region is known for its wineries and hot springs, while the nearby fishing village of Morro Bay, 15 miles northwest, is a hotspot for wildlife (think: otters, seals and Peregrine falcons) and year-round water based sports like sailing, kayaking and stand-up paddle boarding. Need further proof of the Surfliner’s superiority to automobile transport? Four words: Bar Car and Wi-Fi. Good luck finding a car rental with those amenities.